Is your parking lot costing you money when it should be making you money? Smart business owners know a well-managed parking lot makes a direct contribution to their bottom line. Your parking lot is where customers make their first impression of your business. Making sure you offer reserved parking for your store, restaurant, shop or office – keeps your customers from becoming someone else's customers. 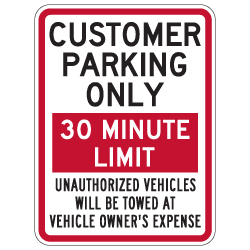 Time Limit Parking Signs are an effective way to keep your reserved for customer parking spaces “open for business". But every parking area is unique. That’s one reason we developed our variable time limit parking sign. You can set your own time limit to fit your business needs and keep your precious customer parking spaces turning over. Start maximizing the earning potential of your parking lot. Order time limit parking signs from STOPSignsAndMore.com!